Drawing No.1 shows the general location of the site and typical images from inside the Villa Tranquila. 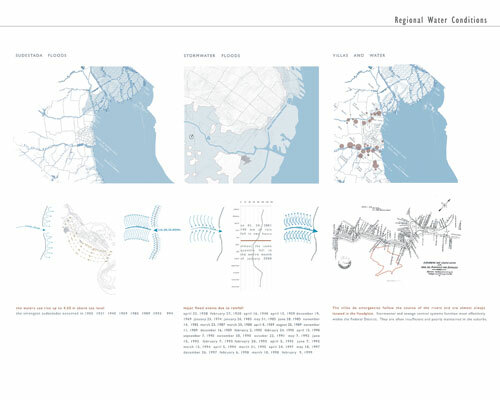 Drawing No.2 is an investigation of the regional weather patterns as they relate to water and how flooding is correlated with low economic and social status. Drawing No.3 is an investigation of water in the Villa Tranquila and how it relates to poor sanitary conditions. It also illustrates how this condition might be exacerbated by the implementation of the municipality's plan. 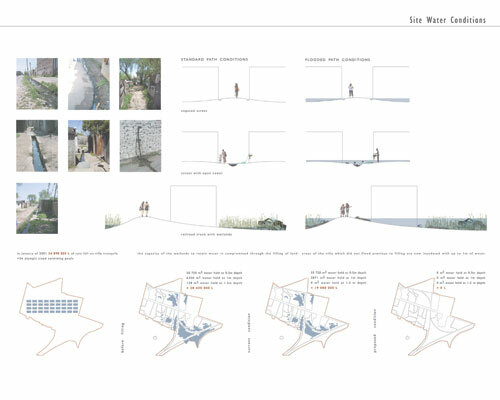 Drawing No.4 analyzes existing networks of stormwater management in the city and the villa. 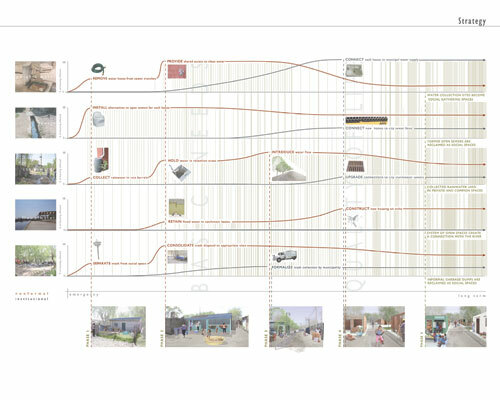 It also analyzes the relationship between buildings, pathways and private space. 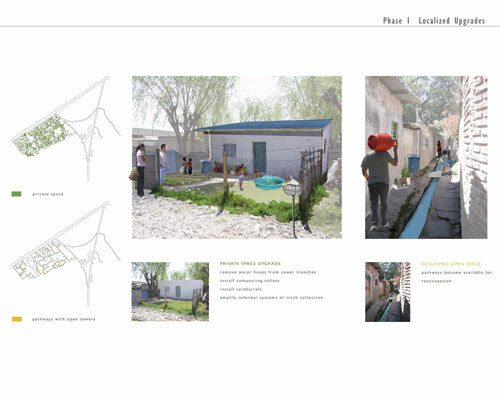 Drawing No.5 analyzes the relationship between water, sanitation and open space and how that space is valued within the villa. 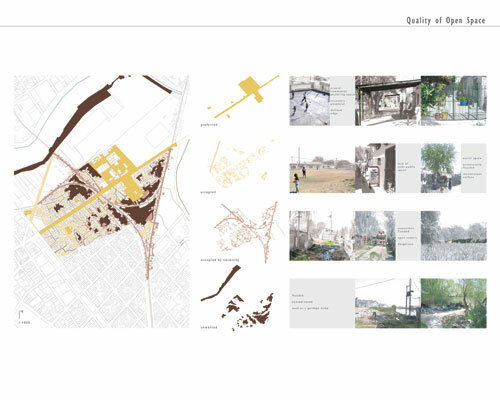 Drawing No.6 proposes a strategy for the integration of nonformal and institutional solutions to the problems of contaminated potable water, stormwater and river flood control, sewage removal and trash disposal. As these problems are addressed over time, open space is reclaimed and made available for occupation, eventually becoming a self-sustaining network that extends through the villa. "Water issues are so important and this project demonstrates how landscape architects can contribute to addressing them in third world countries. It doesn't assume everything will happen at the same time and realistically recognizes that phasing is necessary." The site of our project is a squatter settlement known as "Villa Tranquila," which occupies 60 acres in the municipality of Avellaneda, near the center of the city of Buenos Aires, Argentina. Villa Tranquila is home to 7000 people, almost all of whom are living illegally in self-constructed, substandard housing. This villa represents only 1% of the total population living in shantytowns within the greater metropolitan area of Buenos Aires. Our study of Villa Tranquila encompassed research and a week-long studio trip, during which we were escorted through the community by leaders of the villa who had already formed a relationship with members of the municipality doing work inside. Since the villa is governed internally (police do not enter the settlement), this protected visit afforded us a unique opportunity to speak with residents and to observe site conditions. 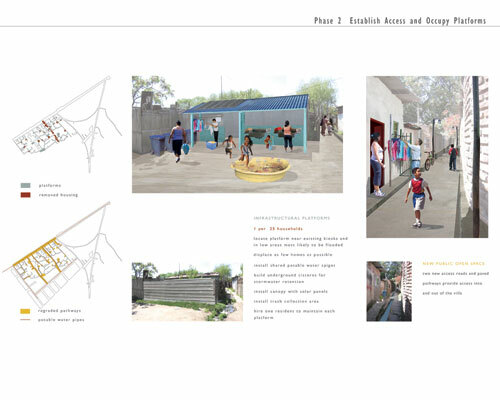 In our analysis, we explored the existing social and environmental conditions to gain an understanding of proposed municipal and locally improvised solutions to the problems of sanitation, security, connectivity, shelter, and open space. 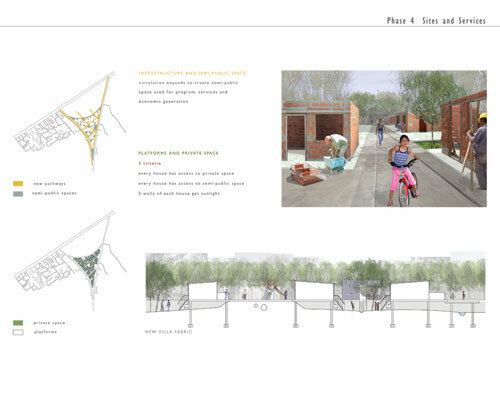 The goal of our project is to produce a set of landscape strategies that could be employed both by the individuals in the community and by the municipality to direct the growth and development of Villa Tranquila, creating a precedent for other squatter settlements in the city. Although it is known as an "emergency" settlement, Villa Tranquila has existed for almost 100 years. The community lies on the banks of the Riachuelo, a river known to the city as "dead" because of its toxic levels of contamination from local industry. The villa's population has fluctuated in concert with the volatile politics and economy of the country, and has most recently experienced a massive influx of individuals left homeless by the economic crash of 2001. 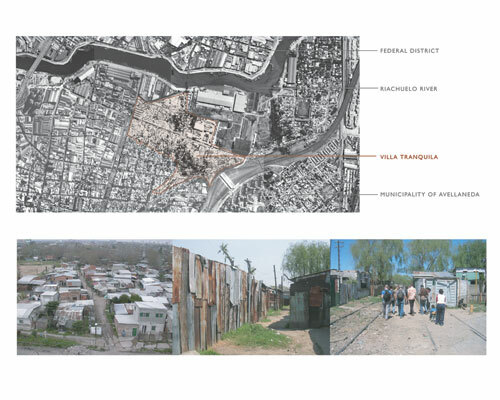 Many of the villa's residents were historically employed at the nearby industrial and manufacturing plants along the Riachuelo, but as industry has moved out of the city, more than 50% of the villa's residents have become unemployed. A plant formerly operated by Unilever remains abandoned on the edge of the community. The extent of physical and social volatility for the residents of Villa Tranquila has prompted the municipal government of Avellaneda to initiate a revitalization program for the settlement. The municipality has already begun to implement a program that removes precarious housing, fills in flooded areas, and constructs new housing on the fill. The municipality's plan proposes to cut the city grid through the fabric of the villa, with sidewalks and new pipes for running water and sewers following the new streets. 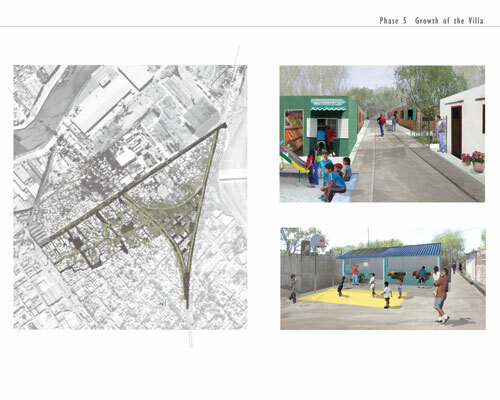 It also proposes revitalizing the Unilever factory as a community center and reopening the defunct rail line that runs through the settlement, reconnecting the villa with the central district of the city. We find several major flaws in the municipality's plan for the future of Villa Tranquila. Members of the community that we spoke with expressed distrust in the project because it relies entirely on the municipal government for its implementation. Having experienced a long history of projects being abandoned when a new party comes into office, residents were reluctant to believe that the municipality's plan would come to fruition. Furthermore, we believe the plan does not respond to the existing fabric of the villa, which reflects the types of open spaces that function and are valued by this community; rather it superimposes the city grid and open space typologies that are not of the place. Most significantly to our project, the municipality has not taken an informed watershed approach to the realities of topography and water on the site. Many of the health and quality of life issues in Villa Tranquila are integrally tied to water. In the villa's current condition, sewage is carried through open channels, potable water is contaminated and trash is dumped in common spaces. Stormwater mixed with sewage and trash floods homes and public spaces, resulting in attitudes which devalue water and lead to further degradation of common space. Buenos Aires suffers a particular type of storm known as a "sudestada," which sends a wall of water upriver, drastically flooding the city every several years. More frequently, Buenos Aires receives intense, heavy rainfall, flooding the city within hours. Because the Riachuelo's edge is higher in elevation than the villa, when flooding occurs, water is unable to drain back into the river. As density in the villa has increased, areas which are only barely habitable have increasingly been occupied, such as constantly wet areas and wedges of land between train tracks. The municipality has begun filling some flooded areas to build new housing, but this has caused flooding up to 4' in older areas of the villa that were previously dry. Our project proposes the complimentary use of non-formal and institutional solutions to address the problems of contaminated potable water, stormwater and river flood control, sewage removal, and trash disposal. This strategy creates a network of drainage and open space that is locally maintained. The generation of this open space network will improve living conditions, generate opportunities for local business and employment and increase connectivity within the villa and to Avellaneda and the Federal District. By directing the flow of stormwater, program can be introduced to previously flooded and unused land, creating the opportunity for villa residents to reclaim and value those spaces. Spaces initially reclaimed for a specific purpose, such as a shared clean water tap, may change their function over time and become part of a greater network of social spaces. Ideally the villa would eventually become integrated into the city; however, if the government were unable to provide formal infrastructure to the settlement, the residents would have a series of internally sustainable landscape strategies that would vastly improve the conditions of the settlement. 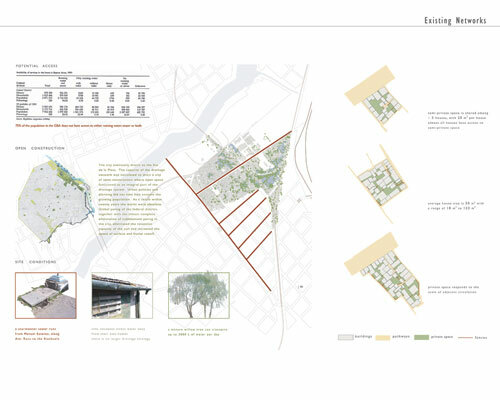 Historically, the Federal District of Buenos Aires utilized a system of "open construction" to control stormwater, using public open space as an integral part of the drainage network. The city acknowledged the limitations of its institutional system and planned for public open space to double as a stormwater overflow system. Because the fabric of the villa does not lend itself to traditional infrastructure and the capacity of the municipal infrastructure is currently inadequate, we propose that some of the non-formal solutions continue into the long term, becoming an integral part of the villa's infrastructural network. We analyzed existing relationships among houses, roads, public space, and private space as a basis both for our approach to intervening in the existing fabric of the villa and for designing new villa fabric. Not only did we consider the existing housing, but also the potential growth of the villa population in the future. Our strategy is therefore two fold: phases one through three propose the development of an open space system for areas of the villa where the condition of the housing is amenable to upgrade, while phases three through five propose a system for the siting of new housing which is sensitive to watershed issues and which is integrally connected to the upgraded areas. It is our intention to propose an open space system with a measure of flexibility to accommodate multiple programmatic needs in different parts of the villa. It is a phased approach from short-term, low-tech insertions to longer-term, infrastructural changes. In phase one, composting toilets are installed locally so that sewage no longer runs through the pathways and contaminates potable water hoses and public spaces. Rain barrels are also installed at each home to collect stormwater for washing dishes and watering plants. The informal system of trash collection is amplified. 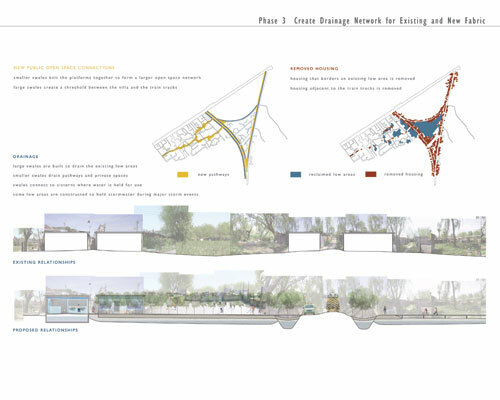 In phase two, plazas are strategically opened in low areas that are most likely to be flooded, such that the open space network can double as stormwater overflow system. Beneath each platform, a cistern will be installed to hold stormwater, heated by solar energy, for such uses as fire protection, cleaning, laundry and cottage industries. One resident will be hired to maintain each plaza. Platforms are inserted such that there is one for approximately every 25 houses. We determined this number based on existing conceptions of "neighborhood" size within the villa made evident by upgrades such as smaller pieces of paved pathways. New access roads are opened where possible to provide strategic access into and out of the villa. Roofs on houses are upgraded and pitched to drain towards the pathways. Pathways are graded and paved to direct stormwater to the cisterns, and pipes are laid for potable water beneath the paths. Trash collection areas and clean potable water taps will be installed at each platform. Small-scale program (daycare, clubs, kiosks, playgrounds, cottage industries) can develop through time based on the localized needs of the residents. Because of the consolidation of water, some of the smaller, lower areas of the villa will no longer collect standing water, providing additional spaces for housing and program. In phase three, a swale system is constructed to connect the platforms in the existing fabric creating a linked open space system. These swales collect and hold additional stormwater, draining eventually to larger swales along the train tracks. This will be accomplished by removing as few homes as possible and without taking away any home's access to private space. The enlargement of the open space system will enable the drainage of standing water and the consequential clean-up of existing lowlands to make them available for larger scale program (soccer fields, community buildings on stilts such as a training center, a center for older residents etc.). Because these areas remain low, new program will be built with the assumption that it will flood, accommodating overflow stormwater during major storm events. In the areas to be developed with new villa fabric, houses that are immediately along the railways are removed in stages such that new housing is always constructed before people are displaced. The residents removed first will be immediately housed in the municipality housing that is already being constructed in the eastern part of the Unilever site. A drainage system will be constructed to enable previously standing water to flow. Large swales, planted with young willows that rapidly transpire stormwater, are built alongside the train tracks, doubling as a protective measure to separate the housing and walkways from the tracks. 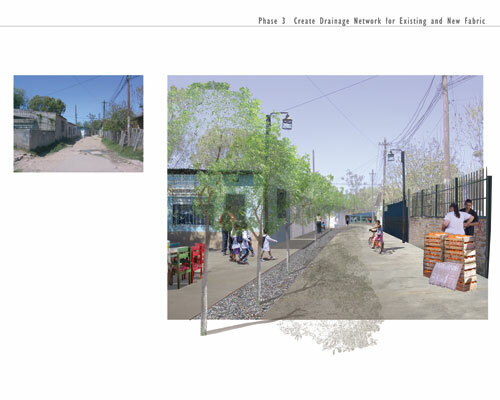 A circulation system moves along the swales and widens at strategic points to create semi-public spaces used for socialization, economic generation, and localized services, such as garbage collection. This new drainage system will allow the flooded areas to be reclaimed by the villa as space for housing, open space, and program. When it reaches the main street, water collected by the swales will be piped to an on-site water treatment facility to be treated for use as potable water in the villa. This facility both promotes the idea of local sustainability for the villa and provides job opportunities for its residents. In phase four, garbage will be removed from the lowlands and vegetation will be selectively removed, maintaining canopy willow trees to shade private spaces and transpire water. Existing pathways will be extended perpendicular to the main street. Soil cut from the swales will be used to create raised berms so that in major rain events when the spaces do briefly flood, the villa's roads, homes, and social spaces are not inundated. Breaks in the berms allow water to flow to the major swales. Sewage and potable water pipes will be laid under the pathways to service the future housing. Widened pathways will also become opportunities for active program such as sports fields, daycare, markets, clubs, and kiosks. Public spaces are connected to create a greater greenway drainage system. Boardwalks above the drainage channels connect the berm pathways, to the greater open space system. New housing will then be constructed along the new pathways. The scale and configuration of existing fabric and our proposed upgrades inform the design of the new housing. Houses will be elevated on stilts such that their front doors meet the raised berm pathways, but their back doors step down to private spaces shared by four to six homes, as in the consolidated areas. Each house will have a rain cistern to collect stormwater so that it can be re-used. As the villa grows and municipal infrastructure is (potentially) introduced over time, the platforms first established as centers for basic services take on multiple programmatic functions, such as playgrounds, marketplaces, and cottage industry locations, as determined by the needs and interests of residents in their surrounding neighborhoods. Drawing No.7 illustrates Phase 1. Drawing No.8 illustrates Phase 2. Drawing No.9 illustrates Phase 3. Drawing No.10 illustrates Phase 3. Drawing No.11 illustrates Phase 4. Drawing No.12 illustrates Phase 5.